I love Vietnamese food. The fresh herbs, the hot sweet and salty sauces, the intense kick of lime and the crunch of raw vegetables are a delicious counterpoint to rich and sticky pork and chicken. Recently, eating out in a Vietnamese cafe with friends, we ordered from the street food menu. The crepes, bánh xèo, were truly memorable for all the reasons I just mentioned so I vowed to myself then and there to attempt to make them at home. My Vietnamese cookbooks gave me permission to freewheel with the fresh herbs and leafy fillings, but the recent pancake had morsels of sticky braised pork belly inside and that was too tempting to ignore. Slow cooking a piece of pork belly in master stock was the easy part. The crepes on the other hand were a major challenge. What can go wrong making pancakes? Firstly I learned the value of explicit recipe instructions. My first pancakes were impossible to turn or lift out of the pan and tasted terrible. I realised at this point that rice flour in the recipe meant glutinous rice flour. I had chosen coarse brown rice flour. I was so annoyed I abandoned that recipe altogether and chose an alternative. Again I had problems. I was about to give up then I realised all the corn starch has dropped out of the batter and was sitting in the bottom of the bowl. The second thing I learned was to read the method carefully. I had made the assumption that I was cooking pancakes like those I cook for breakfast. More fool me. When using cornstarch in pancakes, the batter needs to be whisked just before pouring to make it homogenous. This was NOT like cooking regular breakfast pancake or crepes. While the recipe stated the pan size and recommended a non stick surface, neither worked for me. I had much more control by using a small, well seasoned cast iron pan, my regular pancake pan. Quite by accident or perhaps carelessness I then found the pan needed to be very hot and the amount of oil in the pan was critical. An oiled pan wasn’t enough. It needed a little puddle so that the batter bubbled immediately it hit the pan and fried to crispness. It was a steep learning curve but I’m so glad I persisted because our bánh xèo were delicious. The vegetables: I used, mung bean shoots, snow pea shoots, finely julienned carrot, fresh coriander leaves, fresh mint leaves, finely shredded iceberg lettuce. To make the batter put all the dry ingredients, except the chives into a bowl. Add the water and coconut milk and whisk until smooth. Set aside to rest for 10 minutes then stir in the chives. Choose your favourite pancake pan and preheat until it’s very hot. Add 2 teaspoons of peanut oil, stir the batter*, then pour a small amount into the pan, immediately swirling the batter to lightly coat the pan. It should splutter and bubble. When the top surface is almost cooked scatter over a few pieces of pork. This is a really nice comforting dish! Thanks for sharing! I love the taste of Vietnamese food. I tired for the first time with a friend few months. I ordered pho which everyone talks. I still remember that meal. The broth was so tasty and felt so good to have something warm on a cold day in December. The brisket, flank tasted really good. Trying to eat the noodle with the chopsticks was the most hardest thing to do. At last, I got tired and used a fork 🙂 but overall, it was a great experience trying a new cuisine. Hope to try something new next time. 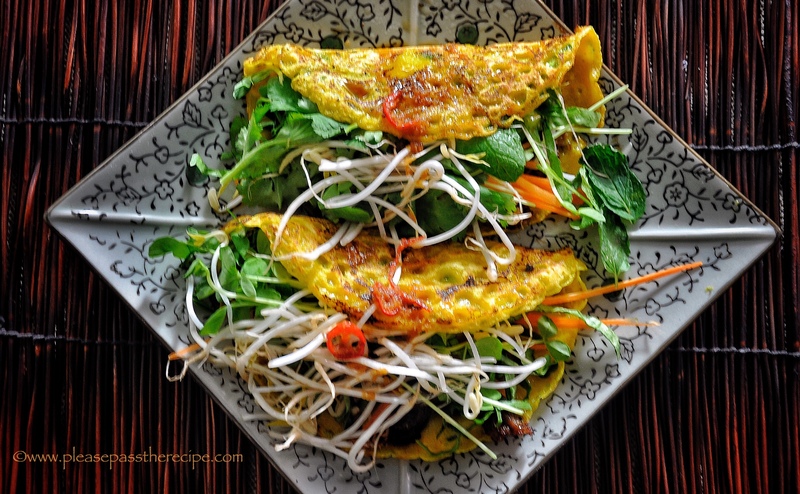 I love the flavours of Vietnamese food too Sandra, so can imagine these pancakes would be totally delicious. Thanks for your persistence in getting the pancake batter and technique right… it’s quite possible I would have caved after the first couple of tries! This sounds amazing, Sandra, love the recipe for the master stock, too. A must-try. Thanks Linda. Master stock is invaluable in my kitchen, a true taste of SE Asia. I hope you like it.. This sounds incredible and I have to try this. The only time I’ve ever eaten Vietnamese food at a restaurant was in Australia by the way. Thanks Stefan, let me know how you go, and enjoy…. I’m glad that we can take advantage of your steep learning curve. Haha please do so my effort is not in vain.. Thank you for this! Have eaten about 70% SE and S Asian for decades but Vietnamese for fresh tastes and Korean as a late coming interest are my current go-tos 🙂 ! Like your batter with its coconut milk, turmeric and garlic chive overtones and shall copy the way you have cooked the pork . . . perchance a weekend trial if time suffices . . .
Wow, this does sound challenging! Glad you persisted, though – what a fabulous meal! I’m intrigued by the action of the cornflour “dropping to the bottom of the bowl”. I think I know what you mean – that white sludge that collects on the bottom of the bowl. I’ve seen this happen time and time again with stir fry marinades. I’m also glad you don’t have to flip this pancake – always tricky! I reckon these pancakes would be useful for all sorts of purposes. Thank you for the recipe and tips! This entry was posted on June 14, 2018 by ladyredspecs in Cooking, Dairy Free, FODMAP diet, Food, Gluten Free, Lactose Free, Light Savoury Dishes, Main Meals, Pork and veal, recipes, vegetables and tagged crepes, FODMAP diet, fresh herbs, gluten free, lactose free, sticky braised pork, street food, stuffed crepes, Vietnamese, Vietnamese street food.